Concrete chipping can be a dusty, noisy job. And during this type of work, employees are subjected to risks of injury and illness due to the stresses and the strains. For example, overhead hammering is essential to performing a thorough job. However, this may increase strain on the body causing weakness and fatigue. At Western, we feel that it is critical for companies to evaluate opportunities to reduce these risks Find Out More. And in doing so, we have discovered the alternative to manual chipping – The Pam Machine. Manufactured by RNP Industries, The Pam Machine offers faster and effortless concrete chipping for overhead and vertical surfaces. It also helps to eliminate and reduce all of the potential health and safety concerns of manual concrete chipping. The machine will hold the 30 pound hammer completely eliminating the ergonomic stress on the employee. 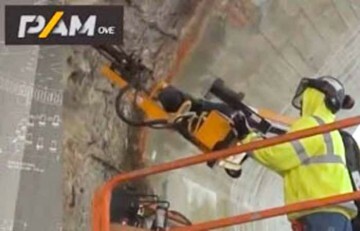 It is easy to position, allowing the worker to continuously and effortlessly work the face of the concrete. There is no longer a need to stop and reposition, recover, or stretch sore muscles since the workers are not performing the work directly. It also allows workers to stand nearly 5 feet away from the point of impact so they are able to avoid unexpected falling concrete. Overall, The Pam Machine is a solution for many hazards in concrete chipping.